We also have young adult sulcata tortoises for sale. As sulcata tortoise breeders we specialize in the african spurred tortoise as well as the ivory sulcata tortoise. Sulcata tortoises are the 3rd largest species of land tortoise and grow to 24″ and from 60-150lbs at full maturity. 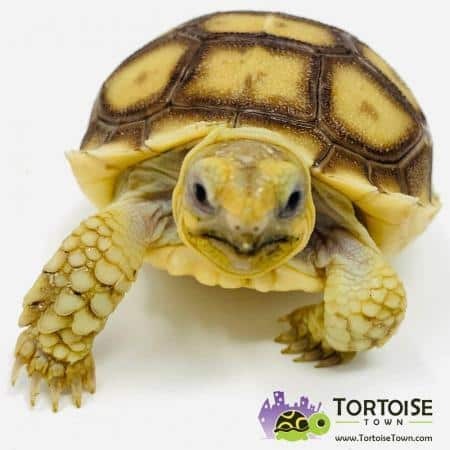 If you are looking for a smaller species, consider the leopard tortoise for sale which ends up about half the size of an african sulcata tortoise. As with all of our tortoises for sale, our baby sulcata tortoise for sale are all 100% captive bred, and cared for inside our INDOOR facility, with a biologist ON SITE. We are proud to only work with captive bred sulcata tortoises for sale and do not work with or sell any “wild caught” African sulcata tortoise for sale. All of our baby sulcatas for sale come with our live arrival and full 7 day health guarantee! Shop with confidence that we will provide you the best baby sulcata tortoises for sale anywhere! When considering a baby sulcata tortoise first you must focus on understand how to construct a proper sulcata tortoise habitat. The african sulcata can be long lived as long as it has the proper tortoise food, proper tortoise habitat, and proper tortoise uvb lights and temperature gradients. Our Sulcata tortoise care section will provide tons of information. Also check out our sulcata tortoise diet page. When considering any tortoise for sale, be sure to make sure you are buying from captive bred tortoise breeders, that do not work with wild caught animals!